The Swiss chalet was large and comfortable, obviously a family home. A series of framed photographs stood on the Grand piano, showing the various members of the family. Starting with a wedding group the collection had grown to encompass the new members as they had been born and later, started school. There was even one, taken only a few weeks ago, showing the whole group skiing in the nearby Alps. Now, save for the lone figure watching the News Programme, it was empty. None of the items made an impression on the figure until the World President appeared on the screen. The figure concentrated hard as the President started to speak. The figure sank back and relaxed. Things were working out just fine. The Programme Controller at the television station allowed herself a small moment of displeasure. It had been a good broadcast but that new vision mixer hadn’t been quick enough cutting away from the picture of the President. The audience out there might have seen him sag as he’d finished his speech. Then again, the old boy didn’t look all that well anyway. He looked as if he was under strain. She shrugged. She’d probably find it a strain doing his job. On Cloudbase, the News broadcast had been watched in horrified silence. Lieutenant Green’s normal smile had vanished, to be replaced by a worried frown. No-one said a word. With no one to defend them, the peoples of Earth were doomed. The Mysterons would win. All this because a politician had changed his mind. Or, as Captain Scarlet surmised, was persuaded to change it. Something started to niggle at the back of his mind. Something he’d just seen had started an alarm bell ringing somewhere in his subconscious. “Play them back.” ordered Scarlet. “All of them?” Green asked in disbelief. “All of them.” Scarlet confirmed. “What are you looking for?” asked Captain Grey. “S. I. G.” replied Green and pressed a switch. Scarlet and Grey started to watch the video screens. “He’s WHAT?” thundered Colonel White. “Thank you, Lieutenant.” White shut off the call. “First we cost too much, now we’re subversive.” he muttered, lapsing into thought. “Thank you, Captain,” replied White. At that moment, the radio crackled as a channel was opened. “Try and contact Cloudbase, Captain,” ordered White. Colonel White had had enough. “This is Colonel White, Commander-in-Chief of Spectrum. By whose authority are these orders?” he demanded. “The World President’s,” came the apologetic reply. A new voice came over the loudspeaker, “This is Geneva Control to Flight Seven Three and Spectrum Jet. You are clear to land on Runway Two-Seven. Captain Blue had no choice.“Roger, Geneva Control,” he acknowledged. The Passenger Jet banked onto Final Approach. The sun was just rising over the hills. It would be another fine day. Colonel White was in no mood for sunrises. Captain Scarlet yawned, stretched and looked at his watch. Six a. m. He and Captain Grey had been working half the night. The first part had been easy, editing out the other news items of no interest such as the Trans-Alpine tunnel report. That just left them with two hours ‘ worth of Political news. “Just what are we looking for?” Captain Grey had asked as they were starting. “Something, anything that seems out of place.” replied Scarlet. So they had watched the video over and over again, forwards and backwards until they both felt that they could recite every word that the politicians had uttered that day. “Yesterday, now.” thought Scarlet grimly. “Good idea. I could do with a break,” agreed Grey. The alarm inside Scarlet’s head ringing again. Faint though it was, it was clear. He now knew that he’d have to concentrate on the President. “I’m going to have another look at the Presidential broadcast,” he told Grey. “I know,” agreed Scarlet. “We’ve been obsessed with what’s being said. I think we should be checking on what isn’t.” He turned on his heel and started back down the corridor. Sighing to himself, Grey followed him. “Unfortunately, Captain that’s just what we are, as far as they’re concerned,” replied White calmly. As soon as the Passenger Jet had landed and rolled to a halt, it had been surrounded by heavily armed security guards. On stepping from the aircraft, the two officers had been arrested, their equipment seized and were now locked, in the absence of cells, in a small rest room in the Control Tower of the airport. Colonel White had immediately demanded to see the World President. The Guard Commander seemed rather uncomfortable at having to arrest Spectrum officers. In fact, for a few moments, he had looked as if he was about to say something, but then thought better of it. He had promised to see what he could do. That had been two hours ago. Since then, they’d heard nothing. “If only we could get to see the World President,” began Captain Blue. He was interrupted by the sound of the door being unlocked. White stood to welcome the visitor. The door opened and a guard entered, followed by a small, bespectacled man, carrying an attache case. The guard saluted and left the room. They heard the door being locked. “Which is?” asked Blue uneasily. “There!” Scarlet’s voice was triumphant. The two officers had spent another two hours peering intently at the flickering screen in front of them. This time they were concentrating on the Presidential address, running it backwards and forwards. Captain Grey felt his eyes beginning to twist in their sockets with the strain. Scarlet rewound the machine a few frames and then pressed ‘play’. “All Spectrum personnel are to surrender to the security services immediately.” the voice on the tape proclaimed. “Failure to do so will result in their immediate -” Scarlet stopped the tape and switched to single-frame. The two officers watched the President as he mouthed the word arrest in slow motion. Then, the clue Scarlet had been looking for; the President’s head appeared to drop and his eyes to close. Unfortunately, the programme cut back to the studio before they could be certain. He read the report carefully. Yes indeed, things were working better than he could ever have hoped. “What do you mean, you can’t raise them?” Scarlet snapped angrily at Lieutenant Green. “Keep trying,” ordered Scarlet. He had the strangest feeling that something, somewhere was horribly wrong. Breakfast completed, the figure stood and prepared to go to work in his office in Geneva. From his smart suit and neat attache case, it was clear he was a man of power and influence. He paused for a moment in front of one of the photographs on the piano. Vague, half-forgotten memories stirred gently in his mind. He turned away and picking up his case, left the room. Later, when he had time, he’d dispose of the photographs. They belonged to a past he no longer cared about. He got into his car and drove away. The annoying thought crossed his mind that he’d have to take the mountain road now that the tunnel was closed. Still, it had been necessary. It cost far too much. At least, that was the reason he’d given for its closure. The real reason, only he knew. Not far away, another figure was waiting, binoculars trained on his quarry. It was bitterly cold that high in the mountains, but the figure was oblivious to it. Only humans feel the cold. Once, as Conrad Turner, he had been a hero in the struggle for world peace, one of Spectrum’s finest officers. Because of this, he had been placed in charge of the Zero-X mission to investigate mysterious signals that had originated on Mars. Now, because of a tragic error of judgement in destroying the Mysteron city, he had not only brought the wrath of the Mysterons upon the earth, but had also become their agent, a puppet totally subservient to their wishes. His name – Captain Black. Through the binoculars, Black could see the elderly gentleman kiss his wife and children, climb into his car and then drive away. He knew what he had to do. He put down the binoculars and reached for the long bundle beside him. Unwrapping the bundle revealed a high-powered rifle with telescopic sight. Putting the sight to his eye, he waited. “I still can’t make contact, Captain,” reported Lieutenant Green unhappily. “Keep trying,” Scarlet replied grimly. Something was definitely wrong. The Colonel wouldn’t miss a report willingly. At that moment, a light flashed on Green’s console. He pressed a switch. “This is Spectrum Control. Go ahead,” he said, trying to hide the worry in his voice. “Court Martial!” echoed Scarlet in disbelief. “Hang on,” whispered the agent, “there’s something going on.” The Spectrum officers heard the microphone being put down. For a few moments they heard only background noise. “What’s going on?” muttered Grey. “I don’t know.” said Scarlet. “I suppose we’ll have to -” he was interrupted by the radio. The agent was now panic stricken and made no attempt to whisper. “Oh my god! They’ve found me. There’s someone with them. It’s the Pres-” There was a burst of automatic fire, a scream then silence. The Spectrum Officers looked at each other aghast. If an agent had lost his life in getting that snippet of information to them, the stakes were high indeed. The President kicked the body lying on the floor of his office. “Get that out of here,” he ordered. Grunting a little at the strain, they dragged the body out, leaving the President and the Commander alone. “Yessir!” The commander saluted, turned on his heel and marched out. As he marched away, he reflected on how drawn the old guy was looking these days. Pressure of work, he thought to himself. As the door slid shut, the President’s head sagged onto his chest. His head ached. Things were wrong, he knew, but the more he tried to think, the greater the pain. Things had been fine until… until… but the memory just wouldn’t come. Mind still churning like a boiling liquid, he fell into an exhausted sleep. The elderly gentleman was enjoying his drive to work despite the slipperiness of the road. “One would have thought,” he pondered, “that by the latter half of the twenty-first century they could have come up with a better way of keeping the mountain roads clear of snow. Ah well.” He contented himself with the fact that, since he would be retiring after this case anyway, he wouldn’t have to worry about it much longer. He drove steadily, enjoying the bright sunshine. Yes, he thought, it had been a great idea to move to the Alpine cottage. Away from the bustle of the City, but only half-an-hour’s drive from it. It was one of the perks of being the chief Judge in Geneva. That he was the oldest and most respected pleased him immensely. On the hillside above, Captain Black lined up the cross-hairs precisely, then squeezed gently on the trigger. The motorist had no chance. With a roar, the charges, laid by Captain Black, exploded and started an avalanche. The driver was shaken from his reverie by the sound. He looked up and saw the avalanche thundering towards him. His foot stabbed at the brake pedal, but to no avail. Wheels locked, the car began to skid uncontrollably. The sound of his scream of terror was lost as the wall of snow and ice, moving faster than an express train, engulfed the car and swept it over the precipice into the gorge below. Black made his way down the mountainside. “Yes,” the judge replied lifelessly, “I know what I must do.” With that, he got into his car and drove away. “Oh I don’t know, really, some case notes perhaps. For example, the assassination of the Director-General of the United Asian Republic. “But how-” Blue began in an astonished voice. “-are we going to retrieve the records?” White continued firmly, cutting off Blue’s question with a barely perceptible shake of the head. “A hostage, in other words,” said Blue sarcastically. “With respect Colonel-” began Blue. “S. I. G. sir,” Blue replied sheepishly. Johanssen looked as if he was about to argue, but then thought better of it. “Thank you, Colonel,” Johanssen smiled weakly. He went to the door and knocked on it. White gestured to Blue and they both turned their backs on Johanssen. “S. I. G. Colonel,” replied Blue. “Coming Captain?” called Johanssen. Without another word, Blue followed him from the room. White gazed out of the window Far below him, through the thick plate glass window, he could see the tiny figures of Blue and Johanssen as they climbed into the Spectrum Passenger Jet. Moments later, It taxied onto the runway and then took off. Soon it had banked over the mountains surrounding the city and disappeared into a bank of cloud. He turned away from the window, lost in thought. Why was Johanssen so set on going to Cloudbase? How did he know about that particular case? Obviously, there was more to Mr Johanssen than met the eye. Twenty minutes later he was disturbed by the sound of the door being unlocked. It was pushed open by a security guard carrying a tray which he put down on the table in the centre of the room. “The condemned man ate a hearty breakfast,” thought Colonel White grimly. “Who the blazes are you?” White demanded as the stranger closed the door behind him. There was an audible click as the guard locked it. “What did you say?” White asked him slowly. But White hadn’t heard him, his mind was racing. Vague ideas were coalescing into horrifying certainties even as he thought about them. “Mr Nielsen, I need you to get me out of here,” White said quickly. White reached over and grabbed Nielsen by the lapels and shook him. “Warn them of what?” Nielsen asked still shaking from White’s grip on him. With a smile of relief, Lieutenant Green reached over and pressed a switch on the panel in front of him “Go ahead, Captain Blue,” he acknowledged. “S. I. G.” acknowledged Blue. 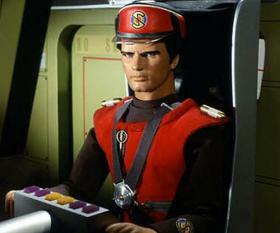 “Is the Colonel with you?” asked Captain Scarlet, who was standing just behind Green. “S. I. G. Captain Blue.” Scarlet signed off. “I’m going back down to the archives.” he informed Green. Something that Captain Grey had said had struck a chord. The World President was being influenced, that he knew. But by whom? “Mr President. Mr President.” No reply. The guard began to tap on the door. Perhaps the old boy had fallen asleep in his office. No reply. Worried, the guard knocked harder. Soon, he was hammering on the door. Inside, the World President was oblivious to it all. The Guard Commander unholstered his gun, took careful aim and fired. Ordering “Cover me!” he kicked the door open and dived through the opening. Rolling on his shoulder as he hit the floor, he came to rest behind a sofa. Cautiously, he peered around the side. What he saw made him leap to his feet. The President, slumped back in his seat, appeared lifeless. “Get an ambulance!” he yelled to the guards who had started to enter the room. He went to the President and started to look for vital signs. The Spectrum Passenger Jet touched down gently on the flight deck and with a roar of reverse thrust, came to a halt. Captain Blue shut down the engines and followed by the still silent Johanssen, disembarked. “We’d better go to the Control room first, Mr Johanssen,” Blue informed him. Still Johanssen said nothing. He still had the blank expression that Blue had noticed before. “S. I. G. Now Mr Johanssen -” Blue’s voice tailed off. Johanssen had vanished. “Come on man!” Colonel White growled impatiently to himself. Nielsen had been away for half an hour already. White had managed to convince him of the urgency of his request. But Nielsen had yet to convince the Guards. Unaware of Captain Scarlet’s actions, and their consequences, he consoled himself that Captain Blue would still take another thirty minutes to reach Cloudbase. So long as Nielsen could get a message to Lieutenant Green within the next half hour, they could prevent a disaster. He was interrupted in his thoughts by the sound of the door being unlocked. Nielsen rushed in, clearly agitated. He reached into his case for an object and calling “Catch!”, threw it across the room to White. To White’s surprise, it was his Spectrum cap. He donned the cap and pulled down the microphone. “This is Colonel White to Cloudbase,” he began. On Cloudbase, Lieutenant Green’s smile at hearing from the Colonel faded, when he heard his message. Then it was his turn to convey bad news. “He’s what?” White thundered in disbelief. White was appalled. “You’ve got to find him at all costs. Use every man we’ve got. White out,” he said signing off, his microphone swinging back up onto the peak of his cap. “We’re too late!” he told Nielsen. “How did you manage to get my cap?” asked Colonel White gratefully. “I’m not hungry,” replied White. “Oh, I don’t mind.” replied Nielsen airily. At that he picked up a sausage and bit into it. “Mmm, It’s good,” he said rather indistinctly. “What’s wrong with him?” asked White. “Mm, I see,” said White pensively. But Nielsen could no longer hear him. The half eaten morsel dropped from lifeless fingers. Eyes staring, his body pitched forward and fell to the floor.